It rained on my first morning in Bruges. This is not unusual. Good weather is not something for which this city is renowned. But I felt cheated. I was on a three-day short break and as I stood on the steps outside the Hotel Europ facing one of the city’s famous canals, Day One looked like being a washout. How very English. It took only a few moments for me to take in the scene from my vantage point of the sturdy citizens of this atmospheric city on a succession of even sturdier bicycles, presumably on their way to work, simply getting on with it, rain or no rain. My other half and I took the hint and stepped into the street, on the way to the first museum on our list. Within half an hour, the rain stopped. Half an hour or so is all it takes to be within reach of many of Bruges’ chief sights to see. The Hotel Europ and many of its contemporaries are only a short walk from the twin squares of the centre, Markt and Burg, along cobbled streets lined with ancient buildings that seem to have changed little since medieval times. 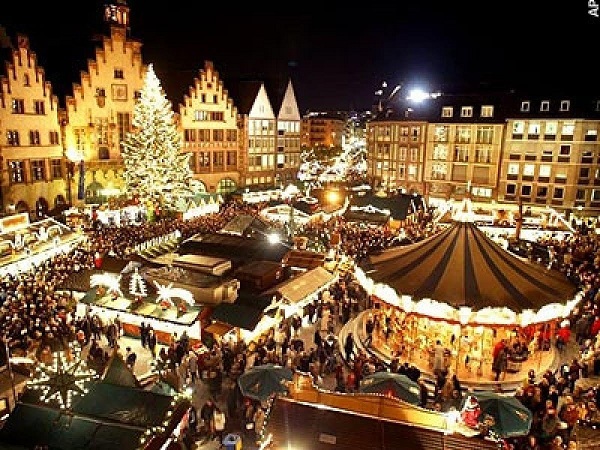 Burg square is dominated by the 14th-century city hall, the Stadhuis, a dazzling confection of a building noted for its Gothic chamber and carved ceiling, while Grote Markt houses the Bruges Christmas market. Judged one of the top five in Europe, its collection of decorated wooden chalets around an ice rink tempts shoppers with an amazing array of gifts, with the whole scene illuminated by thousands of fairy lights. At one end of the square is another Bruges trademark, the 83m Belfry, open to anyone with the stamina to climb the 366 steps to the top to take in the view. The structure and many other landmarks, including canals that would give Amsterdam’s a run for their money, had starring roles in the film In Bruges. That, word of mouth and the advent of Eurostar, which brings the city to within 3hr 30min of hassle-free travel from London St Pancras, have combined to make Bruges a hot destination for the UK market and many others over the past few years. On my first visit, at the tail end of a motoring tour to Italy and back, the place barely registered on the tourism map. Now, you need to pick your moments if you want to avoid being uncomfortably crowded. With that in mind, my latest visit was slotted in over three days midweek, which was how I had time to observe the commuting habits of the locals rather than fighting for space at the attractions. One of these, where we were heading in the rain, is the Groeningemuseum, housing a brilliant collection of Flemish and Belgian art covering 600 years, from (and especially) Jan van Eyck to René Magritte. It’s a real treat, but in typically Bruges fashion is tucked away on an anonymous street, albeit behind a grand frontage on the site of a medieval abbey. More art, including a sculpture of the Madonna by Michelangelo, can be seen in the Church of Our Lady, or, if you’re picking up Dutch as you go along, Onze-Lieve-Vrouwekerk, the oldest parts of which date from the 13th century. Its other chief point of interest is the 122.3m tower, the tallest structure in the city, outclassing even the Belfry. As Bruges has grown in popularity, full details of these and the city’s other leading attractions have become readily available online and via numerous guidebooks. 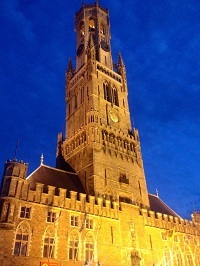 Given the history of this part of northern Europe and Flanders in particular, many of the sights have religious connections, including the revered Basilica of the Holy Blood, but there is a lighter side. One is provided by Choco-Story, a museum whose devotion to chocolate is all-encompassing, with everything you ever needed to know, from the Aztecs to Lindt and beyond. Bruges also boasts a theme park in the shape of the Boudewijn Seapark, complete with dolphin and seal shows – even in winter – as well as water and fairground rides. There are guided tours of the canals and the sights, horse-drawn carriage rides, vendors selling waffles and lots and lots of cafés and bars to while away the time over Belgian coffee or the many strong local beers. The choice of hotels is equally wide, with the likes of the Crowne Plaza, Hotel Navarra or Grand Hotel Casselberg occupying the top end and a host of mid-market properties such as the Europ filling in below. Eating out is equally well catered for with Den Gouden Harynck on Groeninge and De Bottelier on Ezelstraat, a favourite with the locals, heading the list. Despite the name, Tom’s Diner, at West Gistelhof, also gets good ratings, along with the small (seven tables) and cosy Restaurant Aneth on Maria van Bourgondiëlaan.